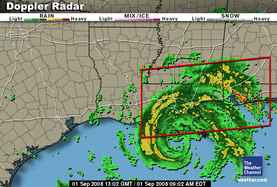 Hurricane Gustav is a result of non-existent global warming, or climate change, one or the other, according to diehard religionists. The hurricane is wetter they say. The Global warming has probably made Hurricane Gustav a bit stronger and wetter, some top scientists said Sunday, but the specific connection between climate change and stronger hurricanes remains an issue of debate. The Atlantic is seeing an increase in storms rated among the strongest. In the past four years, Hurricanes Gustav and Katrina, and six other storms have reached Category 4 or higher with sustained winds of at least 131 mph, according to research at Georgia Tech. Six scientists contacted by The Associated Press on Sunday said this shows some effect of global warming, but they differ on the size of the effect. Measurements of the energy pumped into the air from the warm waters — essentially fuel for hurricanes — has increased dramatically since the mid 1990s, mostly in the strongest of hurricanes, according to a soon-to-be published paper in the journal Geochemistry, Geophysics, Geosystems by Kevin Trenberth, climate analysis chief at National Center for Atmospheric Research in Boulder, Colo.
Leave it to the Left to politicize EVERY natural disaster.